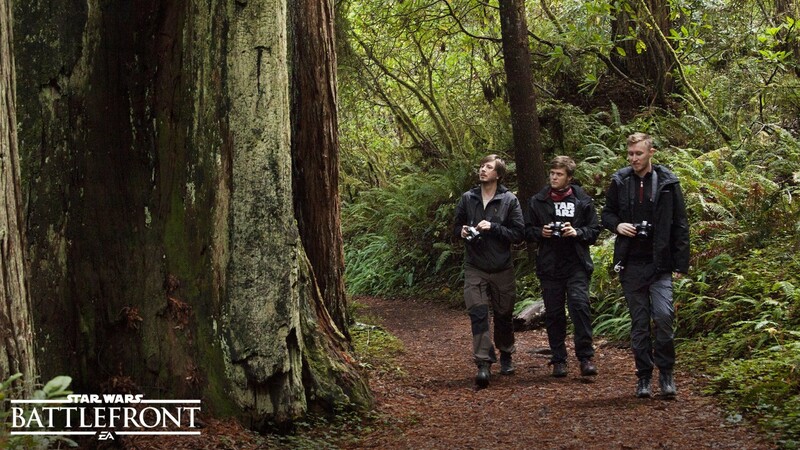 Andrew Hamilton, John Troive, and Anton Grandert surveying “Endor” - the Californian redwood forests. We’ve all been there. Returning home from a trip far, far away with new memories - and often a memory card full of images. DICE experienced this, too, on an astronomical level. Having visited the Lucasfilm Cultural Arts Museum and the original Star Wars™ filming locations, the studio artists brought back several terabytes of inspiration for Star Wars™ Battlefront™. DICE focused on something else other than selfies and food close-ups, though. 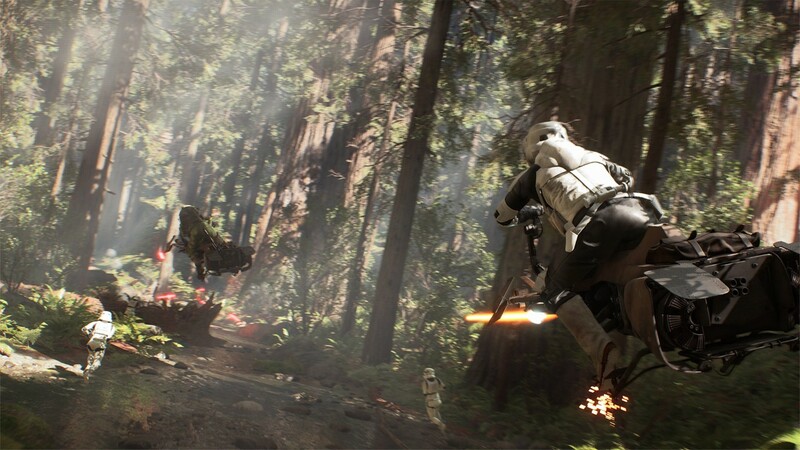 The mission: head to the locations where it all began and capture the basis for hi-res 3D models to the game - including anything from Stormtrooper helmets to giant redwood trees. Key in this process was a technology called photogrammetry. Fed with images, the software creates reference points based on all the angles and “connects the dots,” resulting in a highly detailed foundation of something that can then be turned into a lower resolution game-ready mesh. So, is photogrammetry simply taking a bunch of photos from every possible angle and jamming it into the closest Droid™ that’ll create the model for you? Not quite. As Hamilton puts it, the tech is no “holy grail,” and there’s still a lot of work to be done after this first step. When all of the steps are completed, the level of detail in the 3D models is astounding. More importantly, this process allowed us to stay true to the original look and feel of the Star Wars universe in an unprecedented way. After all, how much closer can you really get, using this technology to create a practically exact digital replica of the original models that captured the imagination of the world? 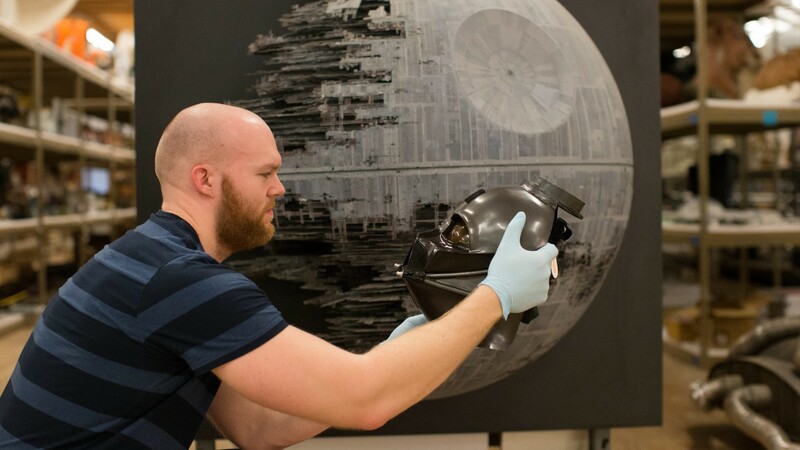 Darth Vader's mask used in Star Wars™: Episode VI: Return of the Jedi™, inspected with awe by Character Artist Björn Arvidsson. Lightsabers™, X-wings, Droids™, and Boba Fett’s armor were carefully carried out by gloved personnel and placed on turntables in front of the DICE team’s cameras. Thanks to a controlled environment and adjustable lighting, shooting overall went smoothly. However, some iconic (and shiny) characters proved to be more resilient to the lens than others. Still photography as well as hours of video and audio recordings were secured to fully capture the atmosphere of the original recording sites. When Arvidsson was combating Sith Lord helmet gloss, Andrew Hamilton faced similar yet different challenges all over the globe. 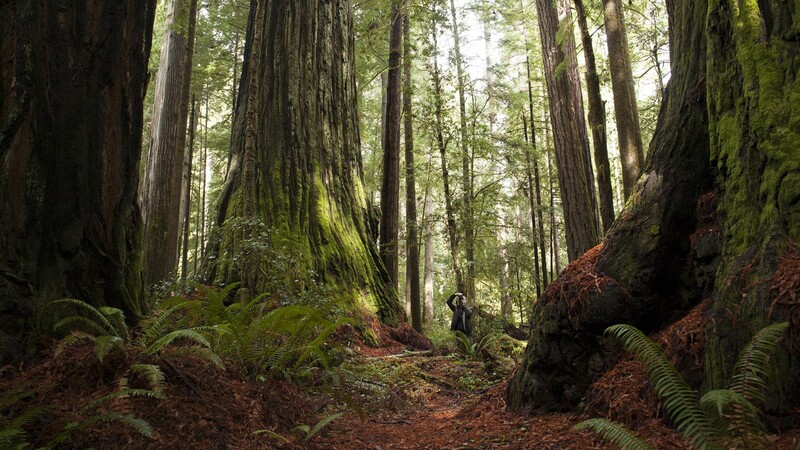 The task of capturing iconic Star Wars locations brought Hamilton and his team to places such as Iceland which eventually was used to create the planet Sullust, and to the other side of the world amongst some of the largest trees on the planet in California’s national redwood forests. Capturing trees, rocks, and entire cliff sides for the photogrammetry process, Hamilton and his team were spared the hassles of man-made objects and shiny helmets. However, nature itself could be a challenge. Shooting during rainfall was impossible, and even after the skies cleared, wet objects were too shiny to photograph. Heat and cold were other challenges, but also a source of inspiration. “We’ve seen both extremes of temperatures when visiting places like Finse, Norway, and Death Valley, California. 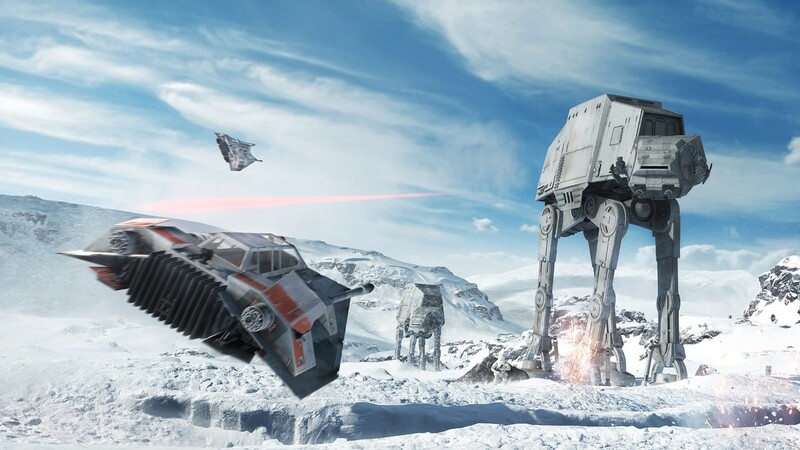 When setting out to create Hoth and Tatooine, we really wanted to get that feeling back into the game, for the players to also experience those extreme conditions,” says Hamilton. 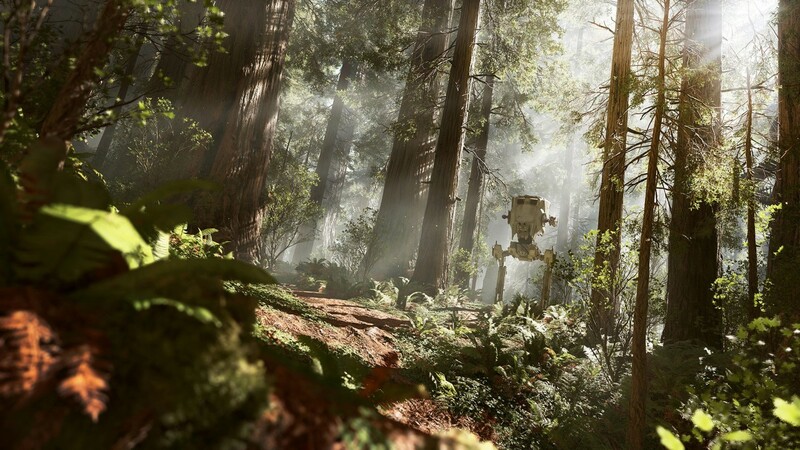 Add an AT-ST lurking in the lush environments and suddenly we're on the forest moon of Endor. With these ultra-realistic assets in the bag, Star Wars Battlefront is sure to look as good and true to the source as possible. Ultimately though, technologies, tools, and polygon counts alone are not the main goal for the DICE teams. If there is a development holy grail, it is to make the overall feel of Star Wars present in the final game. “Our ambition is that players will get the same feeling as we got from our trips: to really feel like they’re inside the movies when playing these iconic locations. Also, we want to open their eyes to new experiences and new planets,” says Hamilton.